My wife and I have not historically been "Halloween people". We started dating in high school and, even then, we weren't ones to dress up and go out. I played drums in bands for many years (yes, I used to be kind of cool) and we did a lot of gigs on Halloween, but these were audiences not gathered to hear music and so they were not my favorite bookings. Today everything is different. With two little girls, Halloween is one of the big days of the year. We've spent a month preparing our "Wolf" and our "Giraffe" to get out and fleece the countryside of candy, the vast majority of which we will never let them consume. When my youngest's giraffe costume arrived I thought she was going to explode with joy. Me too, actually. Our friend Jake Krohn over at Basement Office has featured some Strong Town's content on his site. We wanted to say thanks for the referrals and also for your contributions to the cause. I still have Wahpeton on the list for a Curbside Chat, although it almost made me cry to see how they rebuilt Dakota Street in honor of their cars. We'll connect after elections reset the map. This is a post from last July (not sure why it was flagged on my list this week), but it is still more than timely. Melissa Lafsky at The Infrastructurist suggests that cities should be run like software. Yes. Part of improving local governments will include empowering the citizenry to be more directly involved in day-to-day decisions. Think of the old Sunday meetings in the town square, only now using modern technology and connectivity. We don't need great individual leaders at the local level when we are all empowered to bring about change. In fact, with the right framework... we might be able to create a sort-of operating system for cities — a system that closes the loop between the “eyes on the street,” the problems they spot, and the authorities charged with responding to them. It could have features like a prioritization algorithm, an open-ticket system that will incentivize speedier action (think the tickets you file to the IT guys in your office) and even a layer of data analytics and visualization. Plus there’s the possibility of eventual automation of the problem-reporting process — think streets that tell you when a new pothole is forming. Politicians trying to create jobs and induce growth would do well to read an article from nature.com about Building the best cities for science. I find it interesting that the suggestions for scientists really would apply to any city looking to be a hub of innovation. These are some recurring themes for the New Economy. From case studies, Mary Walshok, a sociologist at the University of California, San Diego, picks out three important factors that make cities sticky for scientists. Promise them the freedom to work on their own ideas. Then give them the tools and infrastructure to do so. Public funding is key to achieving these first two aims, but local private corporations and philanthropists who endow new buildings or research chairs also help. "You can see this happening in Austin, and in Seattle," says Walshok. Walshok's third factor is an attractive lifestyle. Richard Florida, a sociologist and economist at the University of Toronto's Martin Prosperity Institute in Canada, lists scientists among the 'creative class': mobile, talented, creative thinkers that a city must lure in with amenities and smart urban planning. Earlier this week I alluded to some disconnect we have with the Complete Streets approach. I was not able to get back to that as events overtook life, but, in brief, I question the efficacy of imposing a trail on every roadway, regardless of that roadway's function or the return on investment. I've seen miles of trails and sidewalks built with no context to the neighboring land use, neither serving anyone nor connecting anything. Complex streets are a necessity in a city seeking to be a Strong Town, but it should really not be surprising to anyone that building a trail near a simple roadway (a suburban section that lacks urban complexity) provides no substantial benefit to individuals or society. (We love Complete Streets.....Complete Roads we can easily live without). One unique aspect of the study was its “before-and-after” approach — it measured the neighbors’ walking-jogging-cycling frequency before the trail was built and after it was completed. About 87 percent of those who used the new trail reported they were pursuing these activities before the path was constructed and used sidewalks or more distant trails. Proximity to the trail had no significant effect on total physical activity; those near it were no more likely to use it than those farther away. I read a blurb somewhere this week about home ownership rates in the US and Canada. It noted that Canada had comparable -- or even higher -- rates of home ownership without the sacred deduction. Canadians just had smaller homes. So this big subsidy has not gotten us an "ownership society" as hoped, it simply got us bigger houses (to go along with our bigger girth, I suppose). I love Marianne Cusanto's work on "small" homes and so was excited when it was discussed prominently in a NY Times article on The Elusive Small-House Utopia. Check out her website if you want to see some beautiful architecture that I hope will experience the resurgence she is seeking. When Cusato sat down to devise the Home for the New Economy, she tried to consider how families actually use their living areas. She started with a simple, symmetrical three-bedroom plan, excising extraneous spaces — the seldom-used formal dining room, for instance — while enlarging windows wherever she could and adding a wraparound porch. A result was a house that was compact, comfortable, bright and energy-efficient. At Strong Towns, we are trying desperately to wake up the country to the destructive nature of our land use policies and decisions. My particular passion is that of small town and rural America. I'm worried about the future of these fragile places, especially if the status quo toolbox continues to be the only approach of the establishment. But I'm also optimistic because I know that an empowered populace, working together in their own communities, can do amazing things. It was reassuring to find out this week that 87% of my neighbors feel the same way. The study found a sharp increase in the number of rural Minnesotans who believe their communities are struggling. The study found that 37 percent believe quality of life in their community has declined, four times what it was 10 years ago when 9 percent of respondents felt that way. But the study also found 87 percent are confident that they can help their community become a better place to live. Nearly seven in 10 are confident quality of life will improve over the next five years. "The health of rural Minnesota is essential to the health of our entire state," said Jim Hoolihan, president and CEO of the Blandin Foundation. "Rural Minnesotans are struggling to maintain jobs, schools, and checkbooks - and yet have confidence about the future of their communities. Their challenges and assets must be part of the discussion - and a part of the solution - in virtually all matters relevant to the future of Minnesota." And finally, if you see any of these kids show up at your door Sunday night, don't be scared. Just hand over the candy and then back away slowly. 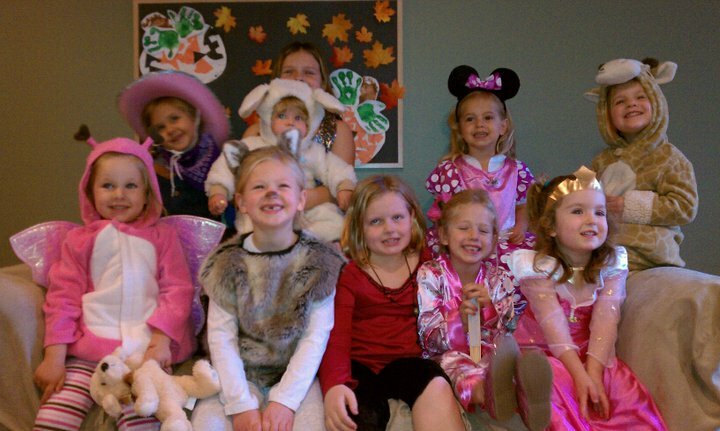 My Chloe is the wolf in the front row (second from the left) and my Stella is the giraffe in the back (far right). The rest are cousins and close friends - ten girls total. Twenty years from now we'll do nothing but go to weddings, but for now we trick or treat and smile the whole time. Stay safe, everyone. You can join Strong Towns on Facebook and Twitter, or sign up for a Curbside Chat and bring the Strong Towns message to your community.